"Reynaldo says that the pacazo is nothing but an uncommonly large iguana. I prefer to believe that it is some imp of history, coincidence made scaled flesh, a god no one worships anymore, not magnificent in its fury like the gods of the Wari or Moche or blood-smeared Chavín but some petty, bitter, local god who hates fat pale pillaging strangers." "Intense, hypnotic and stunningly visceral, Roy Kesey's story of a man driven to madness by the murder of his wife grabs you from the first page and drags you into a dark, hallucinatory journey that you won't want to stop. It's one of those books that reminds you of the great power of a novel to transport and transform a reader." 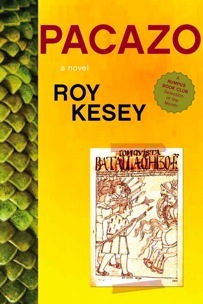 "Roy Kesey's Pacazo is like a cannonball rolling downhill, but even as its readers are propelled forward by this magnificent story, I hope they will also notice all the other things the author does so well. The plain truth is that this is a tender book, and it's a thoughtful one, too. This superb writer knows as much about the human heart as anybody out there, and this novel belongs on the shelf where you keep the books you love best." "We think that Kesey, already so respected for his short stories, is going to be known as a major novelist following the publication of this work." "(A) shaggy-dog tale that eventually—boldly—invites comparison to its great progenitor, Don Quixote... By and large (Pacazo) earns its claim to the old knight's inheritance. (A) fresh and powerful reminder of what fiction can accomplish at full length." "Pacazo is poetic in a way that makes you ask unanswerable questions, is prophetic in its unflinching voice, sweeping in all of its intricacies, and epic in its tale of how we recollect. Kesey has woven a tale that helps us come to terms with our narratives." "I have been a great admirer of Roy Kesey's short fiction for years. (His) talent translates well to his debut novel Pacazo, a compelling tale of love, loss, and madness." "Here, the story--the seamless commingling of past and present--and language play off each other to create (is it too plain a way to say it?) one of the most beautiful books I've ever read." "(Pacazo) expertly negotiates desire: the desire of its readers, the desire of its protagonist, the desire of its author." "(T)his is one hell of a novel, which quietly stakes out unusual territory with such ease that sometimes it’s surprising to realize how deeply immersed one has become in the multiple pasts and the uncertain future of the narrator." "The book is huge, the narrator is huge, and the amount of information to be processed is huge. (...) Kesey keeps us banging up against the smaller possibilities of understanding and resolution..."
"Pacazo (...) is so stunning sentence by sentence, its scenes and characters so intimately connected, they create a portrait of the end of the last millennium that’s surprising in momentum and scale. And that scope may just be the novel’s great achievement." "I could happily drown in this book, is what I’m saying." "Most impressive here is Kesey’s ability to travel centuries in a sentence. Time is absolutely fluid: ancient national myths, personal memories and political merge to create the conflicted consciousness that leads us through this epic book." "(Kesey) is excellent on the country’s past, which he superbly integrates into Segovia’s stream of consciousness, jumping centuries within sentences and creating a web of subtle allusive links between the conquistadors and Incas, and the mix of foreigners and locals that populate the country today." "Pacazo is a beautiful adventure in structure and language, and a brave, honest exploration of extreme and conflicting emotion." "(A)n expansive, occasionally patience-trying, but wholly immersive reading experience – both heart-rending and complex." "Make no mistake: Kesey is a remarkable and serious writer. Stylistically, he sometimes approaches the same category as Don DeLillo or Cormac McCarthy; he is very clearly a poet, and conspicuously original." "Roy Kesey’s book, set in the ancient city of Piura, is big, intelligent and wonderfully original." "A virtuoso display of putting your reader comprehensively through the wringer... This obsessive hunt for justice is utterly convincing." "Loosening the ties of chronology, Kesey achieves extraordinary effects by twisting time frames together, so that within the same paragraph, he can simultaneously relate the "now" of the narrative, the narrator's memories, and historical events. This is three-dimensional storytelling, enhanced repeatedly by a neat trick something like the literary equivalent of Stanley Kubrick's bone-to-space-station jump cut in 2001."